Custom-Steins.com is a subsidiary of M. Cornell Importers, Inc. In business since 1957, we have established long-standing relationships with over 48 factories throughout Europe, the U.K., Asia, and the U.S.A. We have access to European stoneware and glass factories, pewter and ceramic lid and figurine manufacturers, medallion/badge specialists, decal transfer printers and skilled sculptors and painters throughout the world. We provide custom steins, glassware, barware, character steins and figurines/mascots for organizations, business, clubs, military groups, colleges, and more. We are your premiere, FULL SERVICE stein source, assisting you with all phases of your project, from concept to on-time delivery! Our company has been in business for 60 years, proving stability, dedication, reliability and an excellent reputation in the stein industry. We offer the largest selection of custom stein options in the nation, including all the key materials: stoneware, glass, porcelain, pewter, stainless steel, zinc alloy, poly-resin, and wood. We have an experienced, in-house design department, able to incorporate your brand into an existing stein, or create a completely new made-from-scratch product. We offer dozens of decoration techniques, from the simplest to the most elaborate: direct prints, full-color decals, UV prints, organic decals, rub-on decals, medallion applications, removable lids, hand-painting, and fully sculpted 3-dimensional figural designs. We have a global sourcing network, which consists of the best-in-class manufacturers in Europe, Asia, and the USA. We have a centrally located, full-distribution warehouse in St. Paul, MN, staffed by our own company employees. Some of them have been with us 30+ years! We ensure accurate fulfillment of your programs. Most-favorable freight rates from overseas, resulting from our experienced import department and network of efficient forwarders and routers. Safety is our number one goal: we offer full compliance with all state and federal regulations. We Protect your Brand. 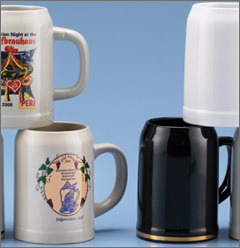 Your custom stein showcases your brand and logo. It makes an important impression to your customers, and we are here to insure that it accurately conveys your brand's message, your mission, passion, and identity. Please call us at (651) 633-8690, fill out an inquiry form, or email us to discuss how we can help with your stein projects. We’ll provide quotes, and are here to help make your stein a standout! We are business-to-business only, so please have your Resale Tax ID Number ready with your inquiry. Thanks, we look forward to working with you!